Cuba’s future economic prosperity lies with the services sector. While agriculture and mining, the country’s two traditional resource-based sources of wealth, will remain important contributors to economic well-being, one of the most promising areas of economic activity, as it is already occurring, will be tourism. Even under the current circumstances, when tourists from the United States are barred from travelling to Cuba, close to two million tourists a year are visiting the country. The gains accruing to Cuba from tourism, although still limited—due to the well-known circumstances of the present—could increase many-fold under more propitious economic and political conditions as the country begins to maximize the forward and backward linkages associated with this sector. In fact, even under the current less than promising situation, this is beginning to happen as the government has gradually taken steps to capture a growing share of tourism revenues (in domestic transportation, provision of foodstuffs, other services). Official policy even extends to the promotion and provision of what has come to be known as medical tourism. Through medical tourism, Cuba offers to foreign patients its medical facilities and personnel to treat a wide array of maladies at internationally competitive prices, as compared to those offered in the United States and Europe. More recently, through a bilateral agreement with Venezuela, Cuba is acquiring petroleum in exchange for medical services provided to selected patients from that nation flown to Havana. Creating the conditions to allow Medicare beneficiaries to receive medical services in Cuba is a logical, and potentially profitable, extension of similar policies initiated under the island’s current government to attract foreign paying patients. If implemented, this strategy could bring substantial revenues to the Cuban economy and help employ many of the country’s health care personnel. Under a more economically rational health care system, attentive to cost issues and market signals, many of Cuba’s health personnel would become redundant or be grossly underutilized. One option would be to have a considerable number of them providing health services to patients from abroad with the cost of those medical services being covered by Medicare, the world’s largest medical insurer. The United States could benefit as well from such policy initiative. By extending Medicare services to Cuba, it would provide financial resources to help with the country’s economic recovery and thus with its political stability. Emigration pressures from Cuba would diminish and the burden on the U.S. Treasury of providing development assistance to Cuba would be commensurately reduced. Over the mid- to long term, potential financial outlays associated with the provision of Medicare services could well reach a point were they exceed foreign financial assistance requirements and enhance the country’s attractiveness as the destination for foreign direct investment. The United States, further, would marginally reduce its Medicare federal outlays, as medical services could be purchased at lower costs in Cuba. For purposes of this discussion, it is assumed that the benefits that would accrue to Cuba from extending Medicare coverage to program beneficiaries residing in the country would begin to have their full impact five to ten years after they initially become available. Such a time period will be minimally required to resolve a host of legal and regulatory issues in both countries before Medicare services can be provided in Cuba. Assuming that a transition in Cuba begins during the 2001-2010 decade, this would coincide with the period (end of the first decade of the 21st century) when Medicare enrollments in the United States will begin to rise from 1.4% per year in 2010 to 2.4% per year in 2030. By about 2010, U.S. baby-boom cohorts will begin to reach retirement age, at the same time as the number of workers per Medicare beneficiary begins to decline, from 3.8 in 1997 to 2.2 by the year 2030 (Antos 1998:47). Due to the confluence of these developments, the political and financial climate in Washington may be propitious to gain Congressional and Executive approval to extend Medicare benefits to eligible recipients willing to avail themselves of these services in Cuba. Cuba’s ability to internationally market medical services is tied to the major investments in health care made by the Castro government over the last four decades, as this sector was assigned the highest domestic priority. The history behind this development is well documented and is only summarized here. This emphasis was driven by the Revolution’s populist objectives and was accentuated during the 1960s by the emigration of close to half of the country’s stock of physicians. As a result, the health authorities were forced to institute a crash physician-training program to address a growing deficit that was being further aggravated by a rapid rate of population increase. In time, and in tandem with an expanding number of hospitals and other medical facilities, the number of national medical training institutions expanded considerably. By 1989, Cuba had 263 hospitals, many of them used as medical training institutions, with more than 66,000 beds distributed across the nation’s territory (Feinsilver 1993:58; Pan American Health Organization 1999). The growth in medical facilities was accompanied by an equally rapid and very considerable increase in the number of physicians. By 1997, Cuba had 62,624 physicians. In fact, by 2001, Cuba had probably achieved one of the lowest population to physician ratio in the world, approximately 175. Also, and for several decades, Cuba has been training foreign physicians in its universities and associated teaching institutions. The most recent example, begun in the late 1990s, was the establishment of the International School of Medicine at the facility formerly occupied by the country’s Naval Academy in Mariel, where thousands of foreign students are being trained in the field of medicine. These efforts have also been accompanied by large-scale expenditures for the establishment of a national biotechnology industry. As a result of these developments, Fidel Castro for years has been boasting that Cuba has become an “international medical power,” and was offering medical aid, mostly in the way of internationalist physicians, to developing countries around the world. Quantitative indicators, of course, have little to say about physician quality. It is known, for instance, that the quality of physician training suffered appreciably during the 1960s and 1970s, as poorly qualified candidates were rushed through medical training (the period of the so-called “siete-mesinos” doctors) as large-scale emigration exacerbated the scarcity of physicians. Most indications suggest, however, that with the passing of time, physician training improved as Cuba adopted many of the educational practices developed in the West to improve the quality of physician education. Current practices rely on training approaches similar to those utilized in the United States. That is, an initial stage of formal education in the biological sciences, followed by intense on-hands internship experience and later post-doctoral training—for those choosing and permitted to do so—in the various medical specialties. Quality assurance procedures appear to be standard, as are the processes of medical certification, continuing education and review. In general, and before the Special Period, Cuba had managed to import and assimilate most modern medical practices and equipment, and is even credited with having pioneered in the use of several primary health care approaches that are widely utilized in the developing world today. Many questions have been raised about the economic rationality of the national health care system crafted by the revolutionary authorities, however. It was long assumed that the health care policies pursued in Cuba were partly made possible by the very significant financial subsidies the country received from the Soviet Union, its former foreign patron. Despite its assumed primary care emphasis, the Cuban health care system relied heavily on expensive capital expenditures and included significant and very costly curative components. The development and implementation of the Cuban health care model was also driven and sustained by political priorities in support of domestic and international symbolic objectives dear to the leadership (Feinsilver 1993). As a result, the sector received a disproportionate and excessive amount of resources (given other national needs), a course of affairs that served to mask the health system’s managerial and structural inefficiencies. The ratio of physicians to population, for example, is well above what is required according to internationally recommended criteria. The family doctor concept, while beneficial in many respects, is wasteful of resources and very expensive to sustain, as are certain medical norms that regulate the recommended number of contacts between patients and physicians (Díaz-Briquets 1986; Alonso, Donate-Armada and Lago 1994). The inefficiency and extravagance of the Cuban health care sector became painfully apparent when Soviet subsidies ended in the early 1990s. Many services deteriorated markedly as the ability to acquire foreign, and often very expensive, health inputs contracted sharply. Shortages of essential medicines and basic hospital supplies became common place. In the absence of external subsidies, it became unmistakably clear that the provision of first world health care services in capital intensive hospital settings staffed with an overabundance of health care personnel could not be sustained with the resources of a third world nation mired in a deep economic contraction. Despite the problems faced by the Cuban health system during the Special Period, the basic medical infrastructure, although severely deteriorated, remains in place. If properly reactivated, and reorganized to provide services to particular populations, it could have an important role in preserving the Cuban people’s health standards and could become an important pillar of the country’s service economy. It could generate important revenue streams with which to finance the needs of the national public health care system and help create employment opportunities for many thousands of skilled and unskilled workers. Allowing accessibility to Medicare benefits to eligible beneficiaries could also have important secondary economic benefits since resident Medicare beneficiaries will also be prone to spend their Social Security pension earnings in Cuba, as well as retirement income received from other sources (private pension plans and lifetime savings). For Medicare services to be extended to program beneficiaries in Cuba, the country must first complete a political and economic transition to a more pluralistic and market oriented system. It is also assumed that such a transition will lead to friendly and close relations with the United States, and that the United States, in turn, will implement the requisite measures to make the availability of Medicare services in Cuba a reality. Established by the Social Security Act of 1965, the Medicare program is the federal health insurance program for individuals 65 years and older; the program also serves younger disabled people. Medicare consists of two parts: Part A for Hospital Insurance and Part B for Medical Insurance. The first is financed primarily by payroll taxes, whereas about a fourth of Part B is financed by beneficiaries’ monthly premiums, and the rest by the federal government’s general revenues. In dollar terms, the size of the Medicare program is gargantuan. Net outlays for the program are expected to reach $292 billion in 2002, or close to 3% of U.S. Gross Domestic Product (Antos 1998:44). Most Medicare beneficiaries have supplemental coverage provided by their former employers or unions, or purchase Medigap Insurance from private companies or groups. Medigap policies, however, are not permitted for beneficiaries enrolled in Medicare managed health maintenance organizations (HMOs). Many capitated (fixed Medicare payments to HMOs per enrolled beneficiary) managed care plans, instead, provide to their members—as part of their cost structure—the equivalent of supplemental insurance costs, some times providing medicines and other medical supplies, although for some specialized services they are allowed to charge additional premiums. Eligibility for Medicare enrollment commences at the beginning of the month when an individual turns 65 years of age, whether the person is working or not. To become eligible, a person must have worked in the United States for at least 20 quarters, a particularly germane consideration for older immigrant workers. Non-working spouses are also covered once this condition is met. Under current laws and regulations, Medicare benefits, barring some minor exceptions, can only be obtained within the United States. Two different populations are likely to take advantage of the availability of Medicare services in Cuba. Perhaps the most important is the sub-population of elderly Cuban-Americans that after years of working in the United States and contributing to the system, have become eligible for Medicare services. Elderly resettlement in the country of birth would not be unique to Cuba; former emigrants to the United States from other source countries, such as Mexico and Poland, often return to their countries of birth upon reaching retirement age. With a political change in the island, many elderly Cuban-Americans may consider resettling in their country of birth and retire on their Social Security earnings (as well as other retirement plans and personal savings), both for emotional reasons and to take advantage of Cuba’s lower living costs. By the time of the 2000 census, several hundred thousand Cuban-Americans 65 years of age and older resided in the United States, a number likely to increase further in the years ahead. By 1999, the number of Medicare beneficiaries in Florida’s Dade County alone, home to the majority of the Cuban-American population, was approaching 300,000. A second important potential population of Medicare beneficiaries likely to utilize these services is composed of retired U.S. citizens of non-Cuban ethnicity that could choose either to reside on a full- or part-time basis in Cuba during certain times of the year. Many retired Americans currently living in countries such as Mexico and Costa Rica rely on similar residential arrangements. Lower living costs, Cuba’s proximity to the United States, and the attractiveness of the country’s climate during the winter months, make Cuba a desirable retirement destination. A friendly policy environment could be used to supplement these economic and geographic advantages to promote Cuba as a retirement and tourist destination for U.S. citizens. One such policy initiative is negotiating access for U.S. citizens for Medicare services in Cuba. At the same time, providing Medicare services in Cuba could act as a powerful incentive for increasing U.S. tourism flows to the country, particularly among the elderly. Lack of quality health care services in tourist destinations acts as a deterrent to travel if the elderly tourist suffers from chronic conditions requiring close monitoring or regularly scheduled care, or if s/he fears the absence of proper care when dealing with emergencies. Thus, the availability of Medicare services could serve to attract retirees, but could also be a significant inducement for the elderly to select Cuba as a tourist destination. The first requirements for this to occur is that a future Cuban government show a willingness to consider this option and design the necessary policy and regulatory procedures to make feasible the extension of Medicare benefits to eligible individuals in the country. These requirements should be relatively easy to achieve with the proper political will given the country’s need to reactivate the economy and employ its work force. Far more complex and difficult are the policy issues that must be resolved before the U.S. government looks with favor on the notion of allowing beneficiaries to receive Medicare-approved services in Cuba and pay for them. Many hurdles will have to be overcome, not least of which are legal barriers against paying for Medicare services (except for some minor exceptions) beyond U.S. borders. A team of researchers, led by David C. Warner at the Lyndon B. Johnson (LBJ) School of Public Affairs, University of Texas at Austin, has studied these issues in some detail (Warner 1997, 1999; Warner and Reed 1993; Policy Research Project 1999a, 1999b). Undertaken as part of a broader research effort to examine U.S.-Mexico health care issues within the North American Free Trade Agreement (NAFTA) framework, these studies were designed to assess the conditions under which it would be feasible to extend Medicare services to beneficiaries residing in Mexico. In doing so, the research team took into account the nature of Medicare benefits and several issues related to the mechanisms currently available or that could be proposed to extend the coverage. Among the latter were the current Mexican health infrastructure and the availability of U.S. health care providers (e.g., HMOs) interested in expanding to Mexico to serve beneficiaries there. 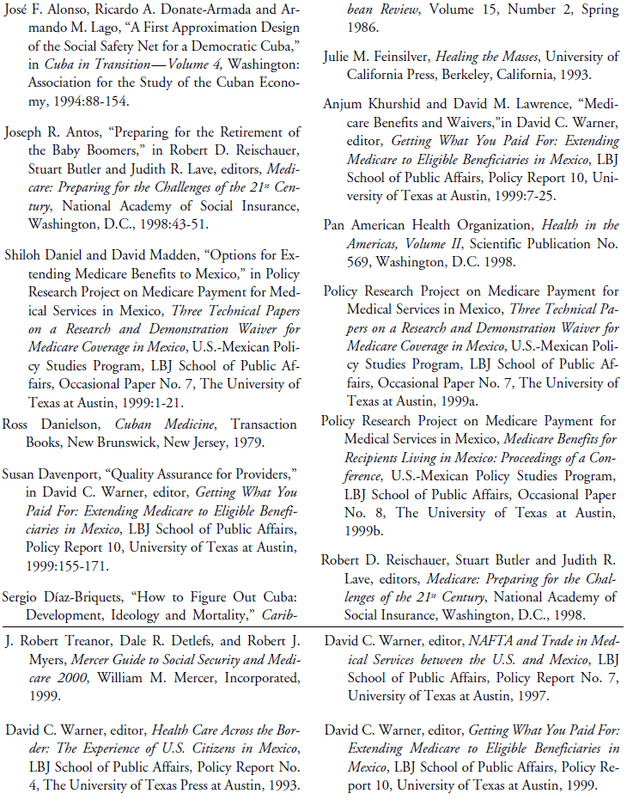 The sections that follow summarize and examine some of the major findings and conclusions of the LBJ School research team and what they imply regarding the possibilities of extending Medicare coverage to beneficiaries in Cuba. The issues are complicated and highly technical in nature and are only discussed schematically here. Interested readers are referred to the detailed treatments presented in the sources cited in the references. As noted by Warner and his colleagues (Policy Research Project 1999a; 12-16), if Medicare coverage were to be extended to Mexico or any other country, Cuba included, the U.S. Congress and/or the Centers for Medicare and Medicaid Services, CMS (formerly the Health Care Finance Administration, or HCFA) must waive several Medicare laws and regulations. No payment may be made under Part A or Part B for any expenses incurred for items or services which are not provided within the United States (except for inpatient hospital services furnished outside the United States under the conditions described in section 1814(f) and, subject to such conditions, limitations, and requirements as are provided under or pursuant to this title, physicians’ services and ambulance services but only for the period during which such inpatient hospital services were furnished). Even if this law were to be amended, it would be necessary to waive other legal requirements, e.g., Sec. 424.123 of the Code of Federal Regulations that requires that beneficiaries be residing in the United States in order to qualify for inpatient hospital services abroad under those [few] circumstances currently allowed. That is, foreign disbursements are only permissible currently for U.S. residents whose homes are closer to a Mexican than to an American hospital along the U.S.-Mexican border, or for those transiting through Canada. It would also be necessary to obtain flexibility waivers from the CMS if a demonstration project (see below) were to be approved, particularly if it appears that the provision of the Medicare services in question could adversely affect quality of care or restrict access to services. In order to adapt successfully to the rapidly changing environment in which health care is provided, the CMS [formerly HCFA] employs various mechanisms to assess the condition of the health care market and determine what changes are needed to make both Medicare and Medicaid more efficient and effective programs. The waiver is one such instrument of modification…. The 1115 “research and demonstration” waiver is a more generic waiver that applies to Medicaid, Medicare, and other Social Security Act programs. Unlike the Medicaid program waivers, the 1115 waiver does not have the constraints associated with the 1915(a) and (b) waivers. Demonstration waivers can be requested to custom fit programs to specific areas, allow certain specific services, or modify other structural aspects of programs. The important requirement that CMS places on demonstration waivers is that they be budget neutral, that is, that they generate no additional cost over what CMS would normally spend. These waivers are usually five year projects, after which an evaluation of their success is completed. Securing such a waiver would be the first step towards extending Medicare coverage to Cuba. This could lead to the establishment of a research and demonstration project, tightly designed and restricted to a small number of beneficiaries, and with the approval of the CMS. The CMS would then determine, within the next five years, if the demonstration project maintains the standard quality of care, does not unreasonably restricts access to services, and is budget neutral. Warner and his associates posit that such a research and demonstration waiver could be designed to evaluate several service options, ranging from the provision of Part A (Hospital Insurance) or Part B (Medical Insurance) services only, to a limited Part A program restricted solely to emergency care, to emergency care with Part B coverage (Daniel and Madden 1999). Waivers could also be used to evaluate the feasibility of some of the newer funding mechanisms created under the Balanced Budget Act of 1997, in particular the Medical Savings Account option, whereby beneficiaries retain maximum control and flexibility over the allocation of their Medicare dollars. • For example, beneficiaries could only be entitled to receive Medicare-paid hospitalization services while they would have to bear all other costs. This would be an improvement over a situation in which beneficiaries residing abroad are prevented from accessing any Medicare benefits. • A limited Part A with emergency care only would provide assurances to beneficiaries abroad that they could be covered for unanticipated emergencies, with the understanding that they would be responsible for Part B services and that they should receive scheduled, non-emergency Part A services in U.S.-based facilities. • Still another option would combine emergency care under Part A exclusively, but with Part B coverage included. Some of these options would require more oversight from the CMS than others, although in all instances a minimum level of oversight is mandated. Even if demonstration waivers were extended, providing Medicare services in Cuba or other countries would be difficult since the provision of these services must meet exacting and well-defined quality assurance criteria that are part and parcel of the American medical system. Some of these have to do with medical education practices, licensing and certification of physicians and other health care personnel. As noted earlier, Cuba’s current system of medical education, licensing and certification appears to resemble quite closely that of the United States. However, for the CMS to certify Cuban physicians as capable of providing services to Medicare beneficiaries, Cuban physician training and certification procedures would have to be harmonized, or at least be found to be consistent, with those in the United States, and procedures established to determine that quality of service is maintained. The same would apply to other medical professionals (e.g., nurses) that must be certified, and to medical facilities that must conform to strict U.S. specifications. The Joint Commission of Accreditation of Healthcare Organizations (JCAHO) is responsible for these functions in the United States (Davenport 1999). A similar body with comparable criteria and acceptable to the CMS would have to be established and certified in Cuba. Similar regulatory functions for hospital and other medical facilities are provided by the Medicare Provider Certification Program. Institutional mechanisms with a similar intent would have to be created in Cuba to provide quality assurance over those professionals and institutions certified as capable of providing optimum care to Medicare beneficiaries. In their review of the Mexican case, Warner and his associates examined the health care landscape in that country, ranging from the national public health care system to private, for-fee facilities. They also took into account the potential role U.S.-based health maintenance organizations (HMOs) could have in the extension of Medicare benefits to Mexico if allowed to do so absent current limitations. How to fulfill the administrative requirements of the Medicaid program is of more than passing interest since Medicare’s financial billing and disbursements procedures are handled through intermediaries, generally state PROs. One option evaluated in some detail was expanding the area of service of existing HMOs in Southern California to Mexico. This approach is appealing since the burden of managing the program and promoting quality assurance lies directly with the HMOs that would provide services to enrollees in Mexico through “point of service” arrangements. HMOs would also manage the payment of fees to health care providers, while implementing health maintenance and cost containment measures within the context of capitated or fixed payments per beneficiary. The assumption here is that the quality assurance provisions being exercised over U.S.-based operations will be extended to Medicare services being provided abroad. While in principle the idea of seeking to extend Medicare services to Cuba makes a great deal of sense from a political and economic standpoint, it will not be easy to formulate the concept in practice, let alone to implement it. The first hurdles to be overcome are of a legal and statutory nature. The Medicare program by law cannot pay for services abroad although it appears that this prohibition may be relaxed under some of the more liberal provisions associated with the research and demonstration waivers and reforms introduced with the Balanced Budget Act of 1997. Congressional action will most likely be required to amend the Social Security Act of 1965 limiting the provision of Medicare services to the United States, although other less drastic options appear to be feasible. A favorable attitude on the part of Congress to support Cuba’s transition and a united stance on the part of the Cuban-American Congressional delegation (currently with three members) and its political allies in that body could be conducive to a proposal for approval of a research and demonstration waiver. This could provide an opportunity for Congresional members interested in extending similar benefits to Mexico to bring their interests to bear. This would constitute a first and important step to eventually seek a more lasting legislative amendment. Optimism must be guarded, however. Despite almost a decade of research and lobbying in favor of such changes, supporters of extending Medicare benefits to Mexico have yet to be able to marshal enough Congressional support to pursue a waiver and associated demonstration project. As was noted at a conference held at the University of Texas in Austin in 1998 (Policy Research Project 199b), few demonstration projects have been approved, and those that have been approved have usually arisen at the instance of Congress. If the Congress so mandated, a demonstration project—be it in Mexico, Cuba, or some other country—would have to be conducted. In such case, “the statutes would not have to be amended and Congress could waive the regulations and the statutes and the study could address some of the quality and access issues” (Policy Research Project 1999b: 40-41). Assuming that a demonstration project could be initiated, with the anticipation that it will ultimately meet the four criteria of access, quality, efficiency and cost (Khurshid and Lawrence 1999:22), the most appropriate delivery venue would be one of the HMOs catering to Cuban-Americans in the Miami area. These HMOs employ board-certified Cuban American physicians already licensed to practice medicine in the United States who have been trained in Cuba or the United States, or in both countries. If these U.S.-licensed physicians were to act as key medical providers (in conjunction with physicians licensed by Cuba) for Medicare beneficiaries receiving services in Cuba, some of the most thorny licensing issues could be by-passed (at least during a transition period), as would be those associated with the equally complex question of liability insurance. The assumption here is that the U.S.-based HMO would assume responsibility as well for malpractice liability claims that might be filed against its Cuban operations. South Florida-based HMOs operating in Cuba are likely to draw most of their membership in Cuba from former residents or part-time residents of the Miami area. Provision of services could be largely circumscribed to metropolitan La Habana, the region from which a disproportionate number of the Cuban- American emigrants came to the United States. A Miami-based HMO could consolidate its operation and manage both its U.S.- and Cuba-based operations from a single central location, while ensuring that Medicare quality standards applied in the United States are also implemented in Cuba, waived requirements aside. U.S.-based HMOs, in fact, could provide the foundation for the reemergence in Cuba of mutualist health care provider associations, venerable institutions that prior to the revolution covered with relative efficiency and at a reasonable cost the health care needs of nearly half of La Habana’s population (Danielson 1979:120-21). U.S.-linked HMOs and Cuban mutualist health care organizations, together with the public health care sector, can be envisioned as playing complementary roles in Cuba’s post-transition health care system. Cuba would stand to gain from this arrangement on two scores. First, it would be better placed to assimilate from abroad (via the HMOs) and disseminate within the country modern medical advances and technologies, as well as managerial practices. And second, by providing services to foreign patients (through the HMOs) and private health care options to paying Cuban patients (through the mutualist associations), the private health care sector would help relieve pressures on a financially starved national public health care system, increasingly burdened by the demands of a rapidly aging population. Once restrictions are lifted, and as the demonstration project is fully evaluated, it could be anticipated that competitors, in association with Cuban providers, would begin to enter the private Cuban health care market. This presupposes a marked increase in average national income and on Cubans having a choice between public and privately provided health care services. If this were to be the case, HMOs would be catering to permanent and temporary Medicare beneficiaries residing in Cuba, as well as competing for a share of the national private health insurance market. As this happens, the Cuban economy would receive a healthy boost from Medicare expenditures and many otherwise underemployed health workers could manage to hold on to more productive jobs. The public health care sector would also benefit, as would the economy in general, as Medicare transfers made possible by taxing corporate and personal earnings flow into national coffers. A certain amount of competition between the public and private sectors would also be healthy since the state will not have the monopolistic lock that invariably results in less than optimal care and considerable waste. 1. Helpful comments and suggestions on an earlier version of this paper were made by Ricardo Puerta and Francisco León.